My weight loss surgery story, from bariatric surgery educator to patient! Hey Weight Loss Surgery Friend! 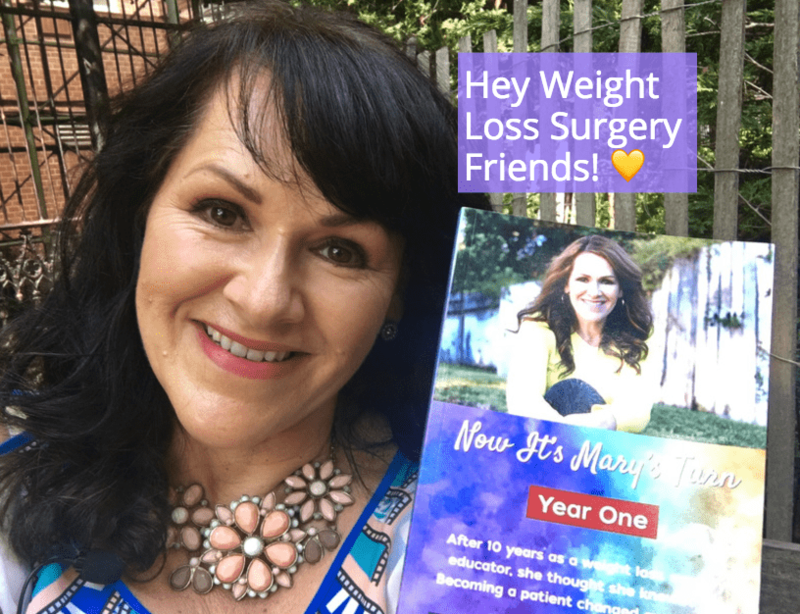 I’m so grateful to be talking about my weight loss surgery story in my book, “Now It’s Mary’s Turn!” It’s been almost a year since it came out and because I have so many new WLS Friends, you may not even know I wrote a book! So please, let me tell you all about it through the VIDEOS below! If you’re preparing for weight loss surgery or had it recently, I hope these stories encourage, inspire and motivate you to plan for life beyond protein shakes, vitamins, and the scale. If you’re further out from weight loss surgery and dealing with a PLATEAU or REGAIN, I hope these stories remind you of the courage you’ve already demonstrated, and how with a heart and mindset shift you can live the life you dreamed of before you had weight loss surgery. Beneath the VIDEOS, check out all the details for your FREE weight loss surgery eWorkbook! Video #1: My heartfelt reason for sharing my obesity and weight loss surgery stories. Video #2: All about the FREE awesome “Now It’s My Turn” Weight Loss Surgery eWorkbook! Video #3: How I ended up needing weight loss surgery even after working in the bariatric surgery field for 10 years! This weight loss surgery eWorkbook is awesome! It inspires you to plan for life beyond protein shakes and the scale. As you work through each exercise, turning insight into action, you’ll be reminded of the courage that’s brought you this far, and how with heart and mindset shifts you can stay on the path to living your best life with weight loss surgery. • Get to the heart of it. What are the circumstances that led to you not being a priority in your life and reaching the point of obesity? This awareness is critical to you setting a new path for your future. • Get clear on your WHY. The same things that motivated you to have weight loss surgery change over time. It’s important to dig deep and understand your big WHY. Plus, I’ll teach you HOW to create a plan so you can get the results you want! • Stay in your lane and stop comparison shame. Let’s talk about how your weight loss surgery journey is not a race or a reason to compare yourself to others. This is YOUR journey. • Shape your weight loss surgery support circles. You’ll find you need different kinds of encouragement and inspiration on different days, from different people. Your support circles are invaluable. Here’s how to shape them. • Create your weight loss surgery backup plans. You’re taking responsibility for what’s next. No more winging-it with your health. I’ll guide you through the steps of creating TWO separate plans so you can keep on living your best life with weight loss surgery no matter what comes up! Get the book AND your FREE weight loss surgery eWorkbook today!